It’s a place of paradoxes. Encompassing some of Spain’s most popular tourist destinations, the very places one thinks of when picturing “Spain,” Catalonia is also a region that is fiercely independent, where citizens still see themselves as distinct from the rest of the country. June 2016, panorama from 3 horizontal images, additional exposures for highlights, focal length 16mm, aperture f/8, shutter speed 25 seconds, ISO 64, tripod. Even its geography is etched with stark contrasts: the peaks of the Pyrenees and the sun-drenched resort areas of the Costa Brava. I came to the Costa Brava for a family vacation during the summer. With so much natural beauty, however, I knew I would spend a good deal of the trip photographing the area’s sights. The Costa Brava is famous — and with good reason — for its beaches and its resorts; as it’s only a short drive from Barcelona and a quick flight from most of the rest of Europe, it’s a consistently popular holiday spot. But there are paradoxes here, as well. For all of the modern resorts and its buzzing, nonstop party atmosphere, there are glimpses of an ancient past. Lloret de Mar, in particular, has a history spanning a millennium; the first written references to the city date to 966. 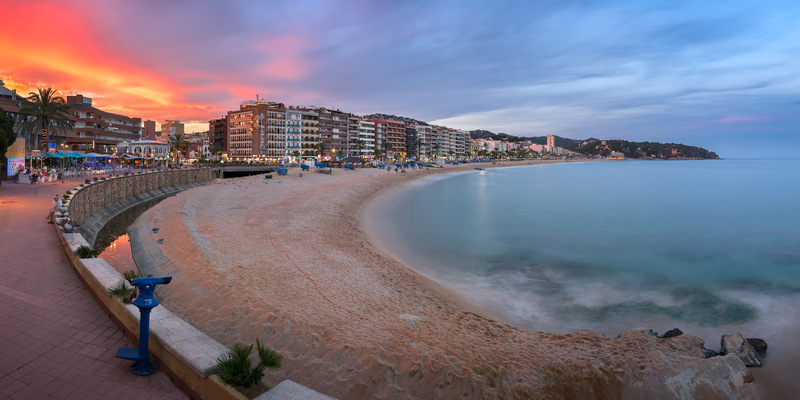 I chose to photograph Lloret de Mar on my first evening in the city. I centered the shot on the city’s iconic seafront. I set up my tripod at the western part of the main promenade — the Passeig d’Agusti Font — just as a spectacular sunset fell over the city. Using a panoramic technique, I was able to capture the full expanse of the seafront and the pastel hues of the fading sun.